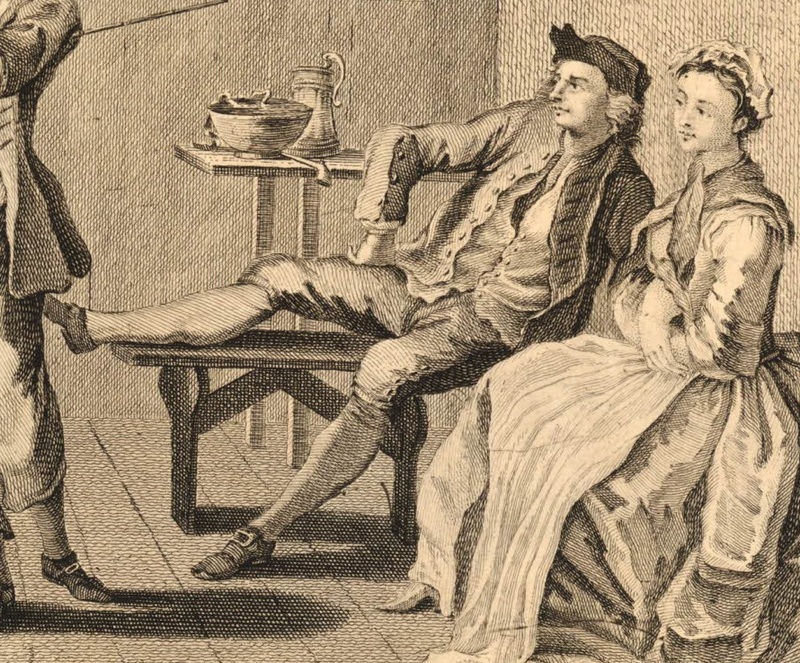 The Humours of a Wapping Landlady, publisher unknown, 1743, British Museum. The Wapping Landlady, engraved from the Original Painting in Vaux Hall Gardens, published by Carrington Bowles, 1743, British Museum. 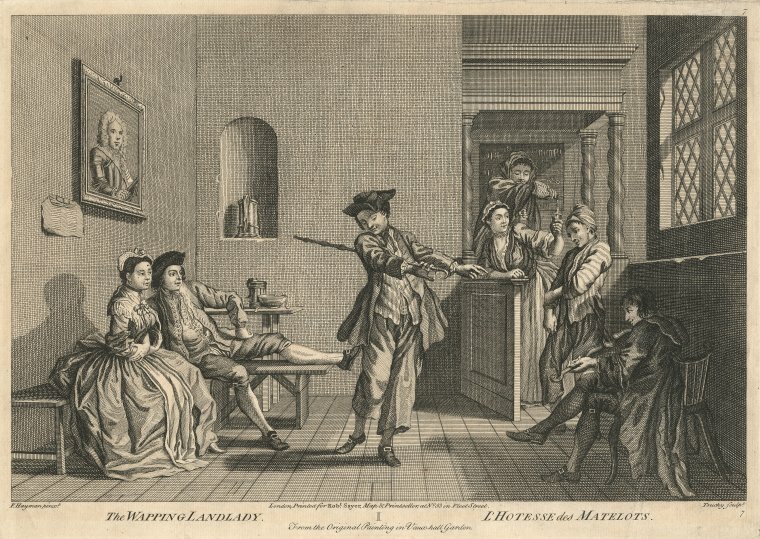 The Wapping Landlady, engraved by L. Truchy, 1767, New York Public Library. All of these prints are derived from the same inspiration: Francis Hayman's painting. 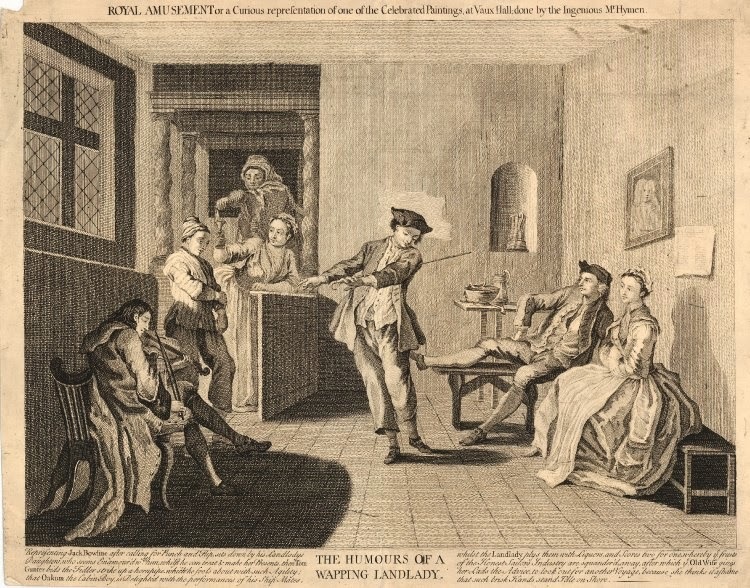 The Victoria and Albert Museum possesses a detail of the original, but it does not include the dancing sailor, bar, or other participants at this jolly gathering. 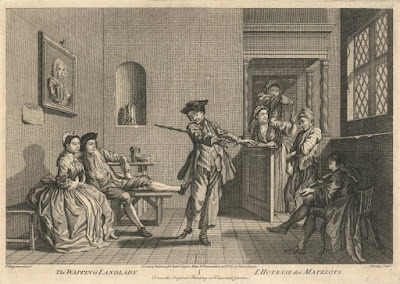 The original painting hung in Vauxhall Gardens, and is described in the 1782 tourists' guide The Ambulator as "The Wapping landlady, and the tars who are just come ashore." Wapping is a well known maritime community in east London along the River Thames in which sailors came and went throughout the eighteenth century. Some ne'er-do-well mariners met their end at Wapping's famous Execution Dock. Having "just come ashore," a mess of sailors enjoy themselves in the landlady's common room. 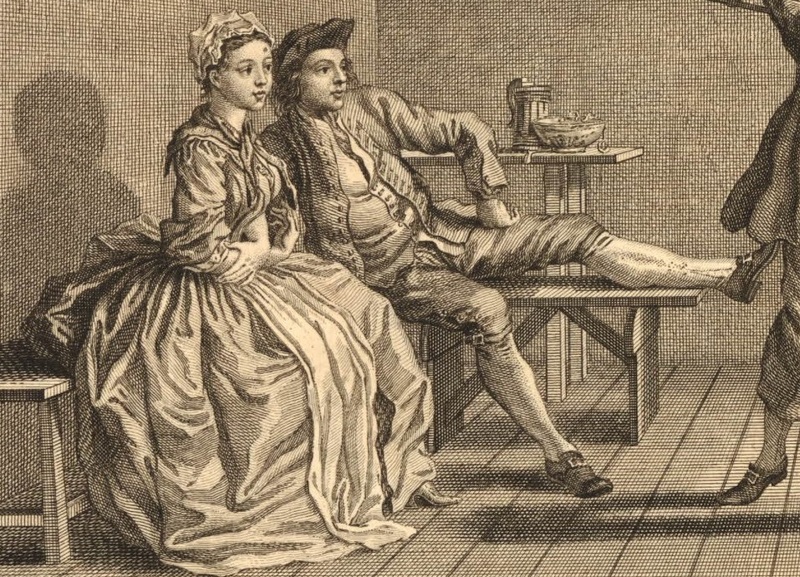 According to the caption text on "The Humours of a Wapping Landlady" the fellow reclining across a bench beside a well dressed woman is Jack Bowline, who courts the landlady's daughter. At center is the dancing Tom Gunter, who has asked the fiddler to "strike up a hornpipe." Standing in a well chosen spot between the fiddler and the bar is the cabin boy Oakum. It is at the bar behind him we find the old landlady, who plies the tarpawlins with liquor so that she can take their hard earned pay. Tom Gunter wears a simple black cocked hat reversed. His hair is short, hanging well above the shoulders. Tom's unlined single breasted jacket stretches to the top of his thighs. Though we get no good view of his buttons, the jacket is without pockets or collar. It does not appear that the cuffs have any buttons. Tom's waistcoat has vertical narrow stripes and a single row of buttons. The cutaway of Tom's waistcoat is open just enough to let us see the two button fly at his waistband. 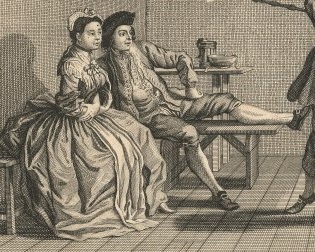 His trousers end above the ankle, revealing light colored stockings. His shoes have a rounded toe. Tom has tucked his hooked walking stick under his left arm. The Bowles version is somewhat more detailed. Tom's hat is looking rather worse for wear, and his neckstock is a bit more easily seen, tucked into his waistcoat though it may be. 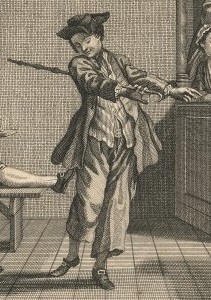 Otherwise, the details of his slop clothes are essentially the same: single breasted jacket without cuffs, trousers with a two button fly at the waistband, and a hooked walking stick (albeit under the right arm this time). The New York Public Library's copy of The Wapping Landlady looks to have been lifted directly from the Bowles' print. The only major differences are Tom's hat (which has somewhat smoother lines) and walking stick (along which the knobs are more bulbous. In the original painting, the sailor is depicted with red breeches, white stockings, and black round toed shoes with decorative yellow metal buckles. 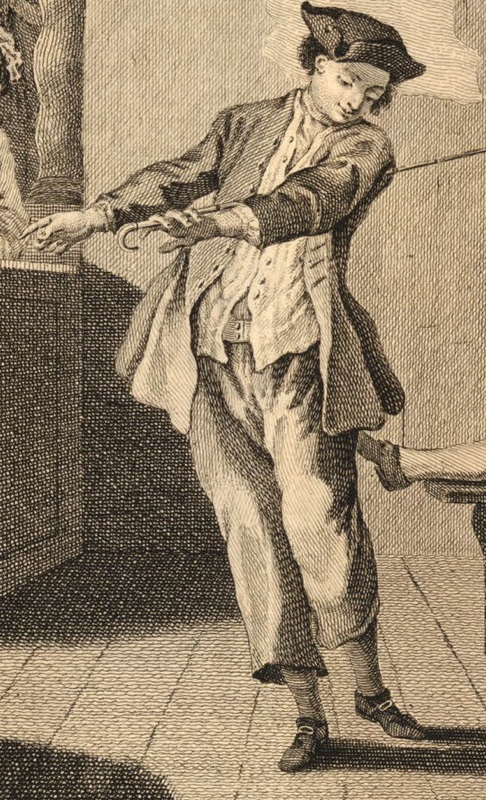 He wears a single breasted white waistcoat with cloth covered buttons, but no neck cloth. His brown jacket is likewise single breasted with cloth covered buttons, and a mariner's cuff with all but one button fastened. His hair is just about should length beneath a cocked hat with remarkably short brim. 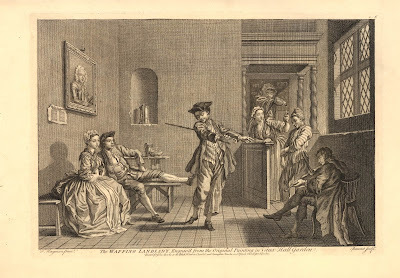 On the table beside him rests a large tankard, punch bowl, and pipe. Interestingly, the prints that followed Hayman's original shows the clothing of the landlady's daughter continually updated by the engraver to keep pace with modern fashion. With the exception of Jack Bowline's hat, his outfit remains relatively unchanged over two and a half decades. 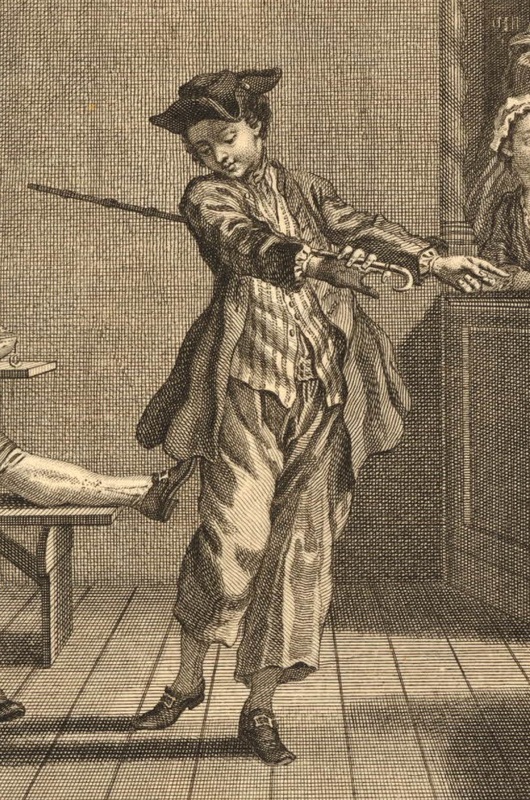 A black cocked hat with the point forward, a single breasted jacket ending about the top of the thigh with open mariner's cuffs, breeches bound below the knee by a buckle. 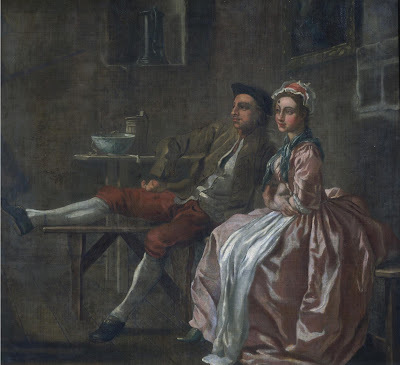 The original painting puts Jack Bowline in red breeches, white stockings, a black cocked hat with remarkably short brim, white waistcoat without neckcloth of any sort, and a brown jacket. Oakum the cabin boy is the most consistently depicted figure in each of the prints. He wears a work cap with horizontal stripes, a loose fitting single breasted striped jacket, and long trousers. Oakum's hair is even shorter than this mates, clinging close to his head. Sorry, mistake delete. I asked if the parts of the original painting that the prints are based on are considered lost? Sadly yes. Only the single fragment in the Victoria and Albert Museum is known to have survived.